From the Y-Me Ranch Hands collection by Westland Giftware. Y-Me Ranch Hands Mildred Maxine Figurine. This Item is in stock and ready to ship. You should not postpone your purchase and miss out on adding Y-Me Ranch Hands Mildred Maxine Figurine to your Y-Me Ranch Hands collection! From the Y-Me Ranch Hands collection by Westland Giftware. 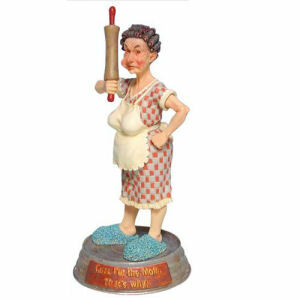 Y-Me Ranch Hands figurine titled Mildred Maxine. Reads Cuzz I'm the Mom, that's why on the base. Made of solid resin. Stands 5.75 inches tall. Westland Giftware Y ME Ranch Figurines shipping from Canada. No Surprise Border fees or Customs!